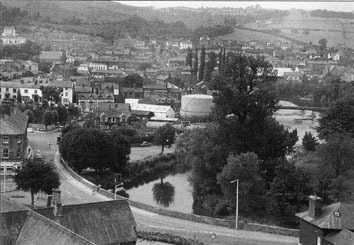 The main features of the river through the town have been recorded in a fascinating summary by local historian, David Pugh. This includes insights into activities that have occurred along the river banks and where some of the familiar and not so familiar names come from. 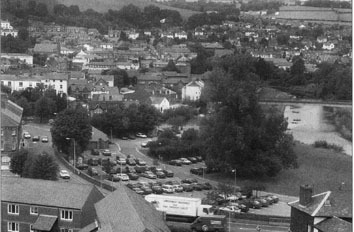 Newtown town centre has suffered flooding over the years, with a severe incident in 1960. This was considered a freak and unlikely to re-occur but in 1964 a similar inundation occurred. This lead to the building of flood defences in 1967 and a change in the course of the river. This change of course caused the famous, venerable black poplar tree to effectively be moved from the right to the left bank of the river. The images above show the original course of the river on the left and the new and current course on the right, pictures by David Pugh. Note also the black poplar tree before extensive topping and the gas works which has been replaced by the car park. The incidence of flooding was also reduced by the construction of the Clywedog Dam which controls the flow of water into the Severn. Parts of the town centre were again flooded in July of 2012 after heavy rain overloaded storm drains, but the scale of this flood was minor compared to earlier incidents. Boating was common on the river from the 1800's up until the flood defences in the 1970's. 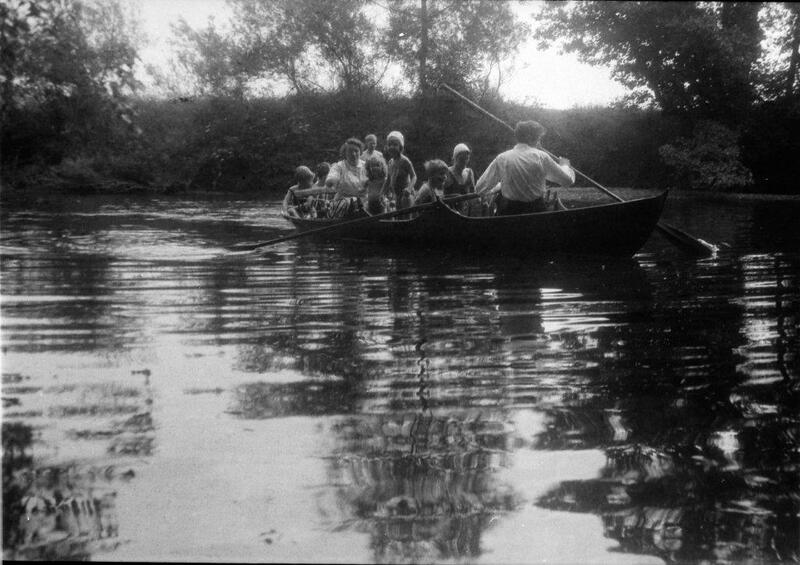 Rowing boats were available for hire from Longbridge to the Rocks, now the site of Dolerw Park Bridge. In 1893 a boat fitted with a steam engine sank and one girl, Maggie Kinsey, was drowned. Boating was effectively stopped after this incident until the 1930's when it again became common. This family group was photographed near Milford around 1950. 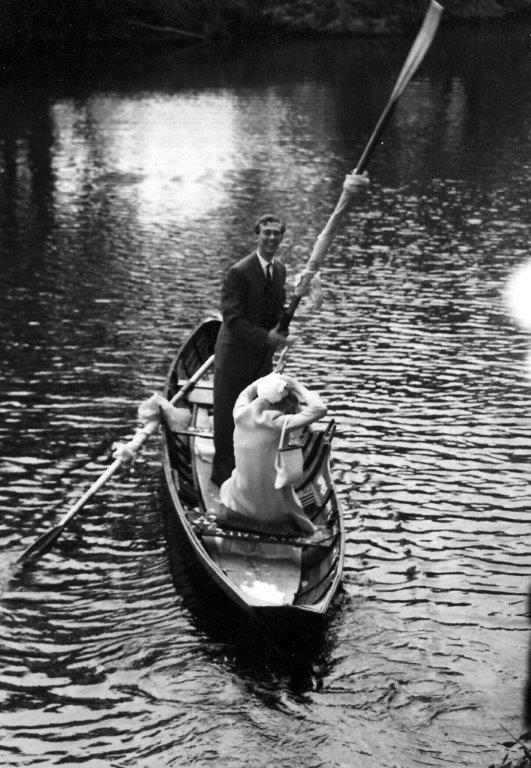 A rowing boat was also used to transport the newly wed Rackhams on the start of their honeymoon in 1967. 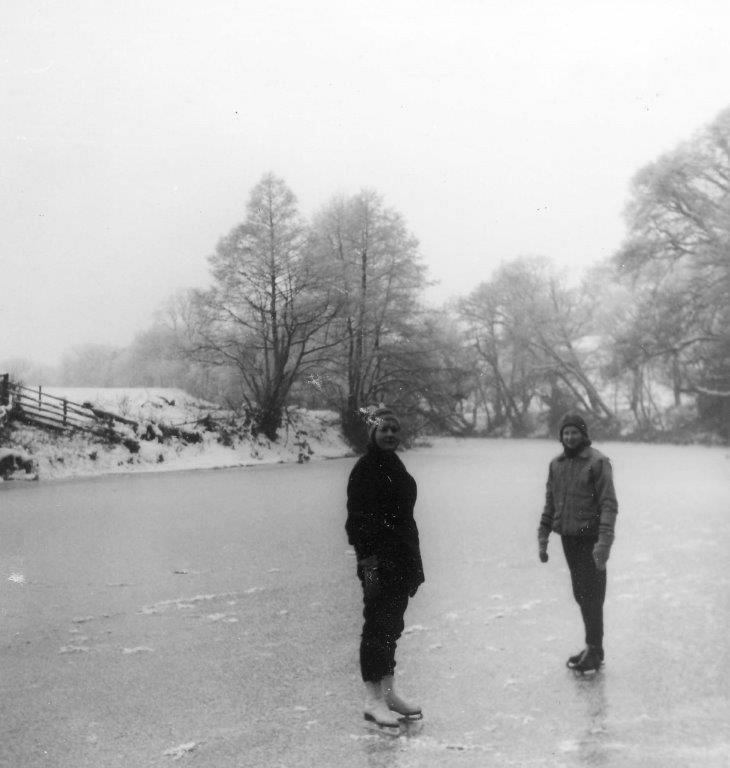 There have been occasions whenthe river has frozen hard enough to skate upon. This photo shows the Lewis girls in 1964.